The global marine seismic equipment and acquisition market demonstrates a highly consolidated competitive landscape, finds a new research study by Transparency Market Research (TMR). In 2015, nearly 90% of the whole market was acquired by the top six players, namely, CGG, PGS, TGS, Polarcus DMCC, Fugro N.V., and SeaBird Exploration PLC. The slowdown in the demand from the main end user of marine seismic equipment and acquisition, that is, the oil and gas industry is expected to intensify the competition within this market substantially in the near future, states the report. As per TMR’s estimations, the global marine seismic equipment market presented an opportunity worth US$0.36 bn in 2015. Expanding at a CAGR of 4.50% during the period from 2016 to 2024, the market is expected to cross US$0.53 bn mark by the end of the forecast period. Over the same period of time, the global market for marine seismic acquisition is estimated to rise from US$3.5 bn in 2015 to US$5.6 bn by 2024, increasing at a CAGR of 5.30%. The 3D survey is the key technology used for marine seismic acquisitions and is projected to continue to lead over the next few years. Europe, Latin America, North America, Asia Pacific, and the Middle East and Africa have been considered as the key regional markets for marine seismic equipment and acquisitions in this research report. With US$944.1 mn in marine seismic acquisition and US$83.1 mn in marine seismic equipment, Europe led this market in 2015. Thanks to the high demand for conventional oil reserves, this regional market is likely to remain seated in the leading position throughout the forecast period. 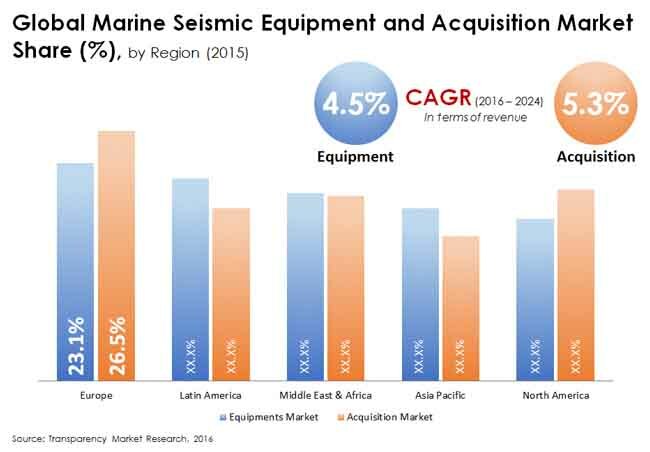 North America stood second in the global marine seismic equipment and acquisition market in 2015. Analysts predict it to retain its position over the next few years, on account of the substantial growth in the end-use industries, such as mining, construction, and oil and gas. However, the most promising opportunities for growth of the marine seismic equipment and acquisition market is expected to be found in Latin America and the Middle East and Africa. Latin America, specifically, is anticipated to turn as a highly lucrative market for marine seismic acquisition on account of the augmenting demand from exploration and production firms. The Middle East and Africa, on the other hand, is projected to benefit marine seismic equipment vendors significantly in the near future due to the substantial rise in its oil and gas industry, states the report. “The tremendous rise in the oil and gas industry across the world is the key factor behind the immense growth of the global marine seismic equipment and acquisition market,” says an analyst at TMR. Marine seismic acquisitions and various analytical data are a critical part of oil and gas exploration procedures. With the increase in oil and gas exploration activities in emerging regions, such as Latin America and Africa, the demand for these acquisitions is likely to escalate significantly in the near future, propelling the market for marine seismic equipment and acquisitions across the world. On the other hand, the decrease in seismic survey contracts and the slow demand for marine seismic acquisitions from the oil industry in the Middle East and Europe may hamper the growth of this market to some extent over the forecast period, notes the study.